That depression may be linked to alterations in glutamate circuits is suggested by the observation that ketamine (which is an NMDA glutamate receptor antagonist) may rapidly reverse depression in some patients. Depression has also been found to be associated in some people with various markers for inflammation (c reactive protein, tumor necrosis factor, interleukin 1 beta, and interleukin 6). As you can see in the picture at the right, stress has a number of effects that promote increase inflammation. Release of catecholamines such as norepinephrine directly stimulates the release of macrophages from the bone marrow. Stress also has direct and indirect ways of activating the macrophages in the brain (called microglial cells). Finally, depression is linked to disruptions in the brain’s reward circuitry which is what leads to anhedonia, one of the key symptoms of depression. Two articles in the October 2016 journal Molecular Psychiatry suggest that these three phenomena are linked. 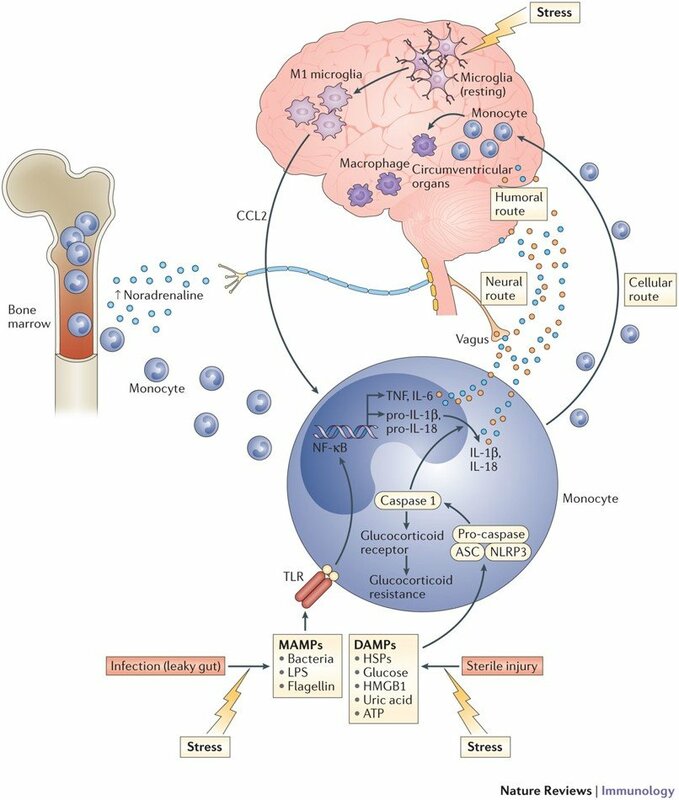 Evolving theories of the pathophysiology of major depression have implicated overactivation of inflammatory pathways, ill-defined changes in glutamate metabolism, and disconnection of cortical and subcortical components of a neural reward circuit. Two studies provide compelling evidence linking these three phenomena. As summarized in Journal Watch Psychiatry, elevated c reactive protein levels (increased inflammation) in patients with untreated depression was associated with higher levels of glutamate in the left basal ganglia. Higher levels of glutamate were also associated with ratings of anhedonia. In a separate study, researchers found that higher levels of c reactive protein were associated with a loss of connectivity in the circuits that connect the reward circuits in the ventral striatum to prefrontal areas responsible for planning and reward based activity. In a study of 50 outpatients with untreated depression, researchers used magnetic resonance spectroscopy to measure glutamate in the basal ganglia and anterior cingulate. They also measured C-reactive protein (CRP) levels in plasma and cerebrospinal fluid (CSF), as well as anhedonia and psychomotor slowing (features of depression that can be caused by interferon-alpha treatment). An elevated plasma CRP level was associated with higher concentrations of glutamate in the left basal ganglia, which in turn was associated with higher self-rated anhedonia and psychomotor slowing on multiple neurocognitive tests. Elevated plasma and CSF CRP levels also were associated with elevations in left basal ganglia myoinositol, a possible marker of glial-cell dysfunction. In a study of 48 depressed patients from the same cohort, researchers examined CRP levels in relation to evidence, on functional magnetic resonance imaging, of connectivity between the striatal areas responsible for motivation (ventral) and motor control (dorsal) and the ventromedial prefrontal cortex (vmPFC). Elevated CRP was associated with diminished connectivity between the striatum (both dorsal and ventral) and the vmPFC. CRP’s effects on connectivity also mediated the association between CRP and both anhedonia and psychomotor slowing. Striatal and vmPFC connectivity was associated with elevations in other pro-inflammatory cytokines.